OK…if you move beyond the diamonds and the gold you have a timeless design that falls into the ‘we can do this’ category. 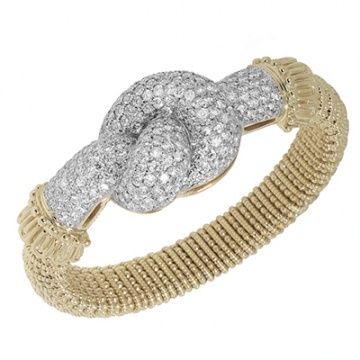 The Love Knot bracelet from Vahan in the June/July Town & Country stopped my page flipping. While the majority of designs at Vahan are waaaaaaaaay too elaborate, I did find the idea of the same design with increasingly larger dimensions interesting. what is your cost for this one. OH MY!!! I have no idea the cost for the diamond and gold bracelet. My goal is to feature interesting designs that, hopefully, will inspire other artists.